"Real difficulties can be overcome. It is only the imaginary ones that are unconquerable." One of the best parts of living off the grid is that you never know what to expect. Every day is certainly different. Most things are good things and there are so many new things. As you move along you meet new people, eat at new joints and visit new places. It’s a life full of new experiences but sometimes it’s just the same as folks who live on the grid. I think the person and the people that person meets sets the stage for many wonderful things. We've met some mighty wonderful people. We picked up Terry’s mom for lunch. The place selected this time was Olive Garden. In the last few days we had already visited Cracker Barrel and Denney’s with her. Terry and I had gone to Olive Garden last week but she wasn't with us then. That was her place of choice this time so that's what we did. Instead of ordering the normal we tried a salad and appetizers. Sometimes that’s better than a regular meal and it certainly was last time. This time it wasn’t quite the same. Our drink orders were taken. Have you ever ordered hot water and lemon? Sabrina orders it all the time. She gets her hot water in a cup with a handle. Well, I ordered it this time. You know what I got. I got hot water served in a glass with an ice tea spoon. Huh? The glass gets hot. Obviously I asked for a cup and eventually it came with lukewarm water. I'm thinking the water from the glass was poured into that cup. The third time was the charm. I finally got hot water in a cup. I never thought ordering hot water would be so difficult. However, we really got our laughs about being served a hot drink in glass. I'm not so sure I'll order it that way again. Service went downhill from there but it was a another new experience and one we hope not to repeat. We did have a good time though and as one fiasco after another happened, we had a lot to laugh about. We had already decided when we return we’ll ask to sit on the other side of the restaurant. Hopefully, the servers don't change sides. I mentioned the other day what a small world it was because we had met some RVers from my old stomping ground, Port Angeles, WA. 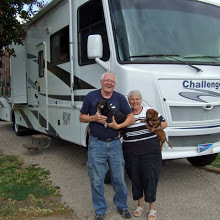 Since we’re heading out to Quartzsite they stopped by to talk about a summer rendezvous when we both get north. Meet Jerry and Louise. They were heading to Q with another group but now a little surgery may detour those plans. Not long after Jerry and Louise left I got a text from our friends, Sandie and Jim. The kingpin on their 5th wheel came loose just as they pulled off at the Q exit. I’m sure you’ll read about it on Sandie's blog eventually. Toni and Doug were already in Q so I sent them a little text. It wasn't long until they were off to see what they could do to help. Once fixed and set up on the BLM, Toni fed the exhausted couple and sent them off to bed. Aren’t friends great?? That’s what this life is all about – looking out for each other. We are truly blessed to have a wonderful family and fantastic friends. We have a family reunion in Port Angeles every summer. The cousins take turns organizing and planning the reunion. This year it's our turn. There's always a theme to each reunion. Last year the theme was military. This year our theme is Texas Roundup. I've put Sabrina in charge of decorations. You've all seen examples of her work!! Then, I put Tammi in charge of activities! How's that for delegating? It's a win-win combination. I've already received loads of ideas from both of them so we're way ahead of the game. Yesterday I printed postcard invitations and mailed those out as well as sent out the same invitation via email. I'll do reminders every other month until the big date. Time to get Terry up. My ME time is over and I hear that road calling us. Q here we come! Hurry up and get here. I keep thinking about changing that picture and then I forget about it. It's that old age thing. And I'm not sure I remember how to do it. How many ways can hot water her screwed up? Glad Toni and Doug were there for Sandie and Jim. Those two sure have had some tuff luck with that set up. Have a great time in at Q. That's really a great job of delegating. Doesn't leave much for you to do other than coordinate. Have fun at the Q.
Gonna miss the Q but I know you will have a ton of fun. enjoy! Hot water in a glass!!! I have had dumb wait people work for me but never heard of that one! Can't wait to see what the kids come up with for your reunion, they are so clever! Where do they get that from? So glad you made it here safe and sound. You all need to show us the ropes. It is so neat to put faces with names. Now, if I can remember which name goes with whick face, I will be OK. I read Sandie's blog earlier. So glad you were able to get some help to them. Nothing quite so special as having friends.